I am just curious what the range and mean for saddle to bar drop may be for most racers nowdays. Mine is 7cm, which I suspect is less than most. But I am even older than Pcad, if such a thing is even possible. Last edited by Skewer; 02-12-09 at 03:37 PM. new bike is limited by the head tube 10cm to the bars 25 to the drops(old bike was +3cm). 11cm, and I'm a fat old man. In actuality, it doesn't matter that much. You can get as aero as you need without much drop at all, just by bending your elbows. Damn, I can't imagine being stuck at 10cm. I felt like 11cm on my old frame was practically a beach cruiser. I'm now head tube limited, but I could have put a -17D stem on my SL to squeeze another cm out of it. AHHH! merlin, you stole the transponder! Thanks for your replies. I think I could go lower pretty easily without any discomfort. I have pretty good core muscles and flexibility. Last edited by Skewer; 02-12-09 at 03:59 PM. Don't flip it if you're not comfortable doing so. A huge saddle to bar drop does not a good bike racer make. 21cm to the tops. Tall and lanky. I'm in the drops most of the time. Somebody measure this for me. +1 screw fashion, put your bars where they feel best. Last edited by umd; 02-12-09 at 04:36 PM. No I bought one, so I have the same number all the time,and don't have to bother with it. 15cm, but I think I might drop it another cm, since I've got some spacers still (short headtube - 138mm). I wanted to reply and then I realized I never took the time to measure. I would guess about 6". I have zero spacers and the stem flipped down. Good point. I seem to be able to get plenty aero without having much drop. The reason I don't have much drop is because my current road racing frame is likely too big for me. 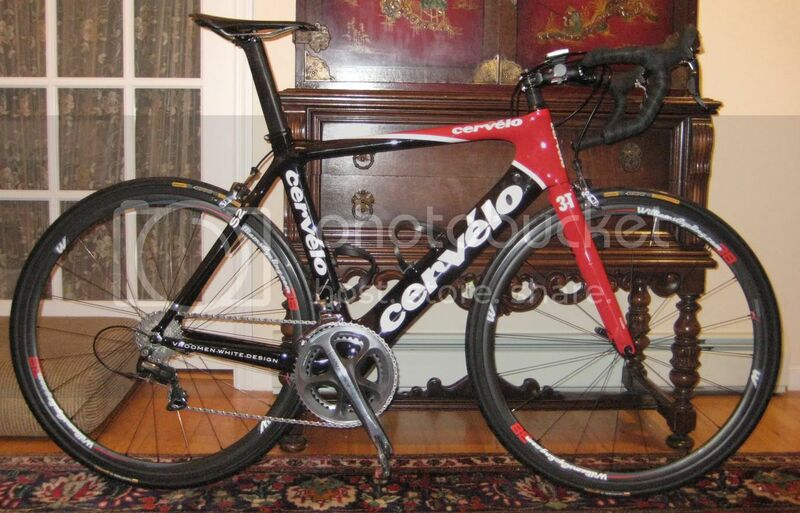 I have a loaner bike this week that I might buy, and was just thinking about how best to set it up. I am kind of gathering that saddle to bar drop is not really a very critical measurement, as long as it doesn't somehow prevent you from riding reasonably aero most of the time (assuming riding aero might be a goal), and beyond that, it may be an aesthetic preference. I suspect that many people could deal comfortably with a range of saddle to bar drop measurements and from bike to bike it isn't always the same, whereas saddle height and saddle setback don't change much. Last edited by Skewer; 02-12-09 at 10:17 PM. you're 6'3" too, right? It's good to smite those looking for a good draft. I defaulted to 13-14cm and everytime I see the fitter for a small tweak he's like, "are you ready to go lower" and I just shrug and say sure. Either he reads this board or has a vendetta against spacers because I only have one left. I'm stuck at 7.5cm with a -17 stem with no spacers, but I still have no trouble getting my back flat... I think... I should get some pics and post my own "check my fit" thread to be sure. You shouldn't ask other men to measure your saddle to bar drop.